The best cat carrier is going to be well made from sturdy materials that will stand up to the rigors and demands of a fussy cat. These materials include sturdy zippers and fasteners that can’t be clawed or pried open as well as materials that can be easily cleaned and taken care of when the cat isn’t in the carrier. 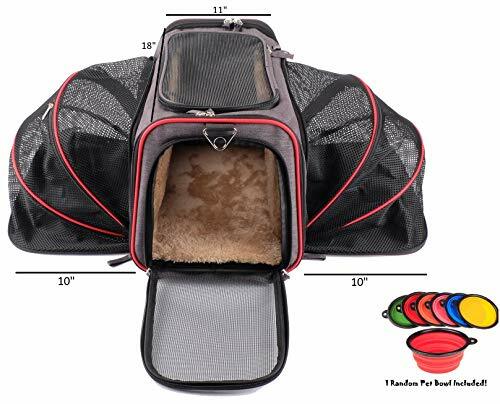 Our top pick, the Pet Peppy Expandable Pet Carrier, is an incredibly unique and high-quality pet carrier that provides much more than just a place to carry your cat while traveling. We loved the expandable sides that provide plenty of room for our cat to move around and even play a bit while having to be confined to the carrier. The strong, wire frame is durable and gives the carrier a solid base that doesn’t sag at the corners. There are all kinds of cat carriers on the market ranging from soft-sided models to hard-sided carriers. They come in many shapes, sizes, and colors too. The most important factor in choosing a cat carrier is the type of cat you own. A cat’s personality is a good determining factor as to the kind of cat carrier they will tolerate and this is something to consider before you purchase one. If your cat hates open space, a carrier that has air circulation mesh but not large open spaces is a better choice. This way they can feel like they are “hiding” from strange eyes. If your cat is a big scratcher, you may want to consider a hard-sided case which will stand up to his or her claws much better. A cat’s claws can wear down and tear the sides of a fabric carrier which would require that it be replaced. There are some other factors to look at as well that we will review in this buyer’s guide. The purpose of the guide is to help you sort through the large number of choices so that you can purchase a cat carrier that will be perfect for your cat and perfect for your needs too. This fascinating and unique cat carrier provides plenty of space for your cat to hang out in comfortably while traveling. There is plenty of air circulation in this cat carrier turned cat mini condo. The two sides expand giving the cat plenty of room to stretch out and lie down comfortably. It has two convenient openings with which to put the cat in and out; one on the top and one in the front. With all the ventilation on top and the expandable sides, your cat will not feel trapped. The frame of the cat carrier is made from strong wire that encircles the entire carrier and provides plenty of stability. This strong wire prevents the cat carrier from sagging at the corners or bunching up at the edges. Cats up to 14 pounds can travel comfortably in this sharp-looking, functional carrier. The wire frame also acts as an additional barrier to protect your cat from accidental bumps while the carrier is being carried. The comfortable and plush fleece lining provides a soft and comfortable place for your cat to lie down. This convenient cat carrier has an adjustable strap and handle that allows you to carry it just like you would a suitcase for ultimate mobility. It is airline friendly as well although you may need to ask about unzipping the expandable sides when you are on the plane. The side pocket is slip-design so you can just slide the cat’s belongings into the pocket such as treats, food or medicine. When not in use, we loved the fact that the carrier folded completely flat for easy storage. Pet Peppy comes with a 1 year, 100% money back guarantee. If you are unhappy for any reason, you can return it with no questions asked. It is available in either red or black. If you do a lot of traveling, you will want to take a look at Mr. Peanut’s soft-sided cat carrier. It is airline approved and appropriate for cats up to 14 pounds but it is always important to check with the airline first to ensure there are no new regulations. The ventilated roof can be collapsed to meet the airlines’ regulatory 8 ½” so it can safely slide under the airplane seats. It has a safety seat belt buckle that allows it to be restrained in a regular vehicle seat using the vehicle’s seat belt. The attractive Oxford, 2-tone fabric washes easily and has an interior fleece padding that is dry clean only. There is plenty of breathable mesh that gives the cat ample ventilation. The padded shoulder strap makes the cat carrier easy to carry and the ID tag and storage compartments can hold the cat’s medicine, treats or even a few small toys. For added security while traveling, the zipper on the carrier locks. It is available in several attractive colors. 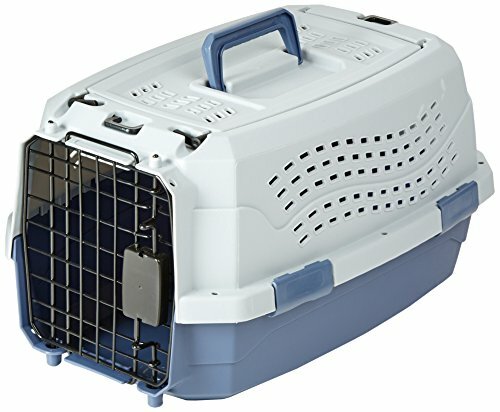 This hard-sided cat carrier provides a solid barrier when you are traveling on planes or in any other public transport. It has two doors that allow for easy loading of your cat. The top door conveniently opens from the left or right. This cat carrier comes with screws that can be screwed in to provide additional security, especially if your cat loves to try to escape. The durable, hard plastic has a steel wire front door and holes all around the sides to increase airflow. The cat carrier can be carried easily with the attached handle on top of the carrier. Other added features of this cat carrier include a spring-loaded latch that securely keeps your cat inside. It is easily opened by squeezing together the top and bottom levers that will allow the door to easily swing open. 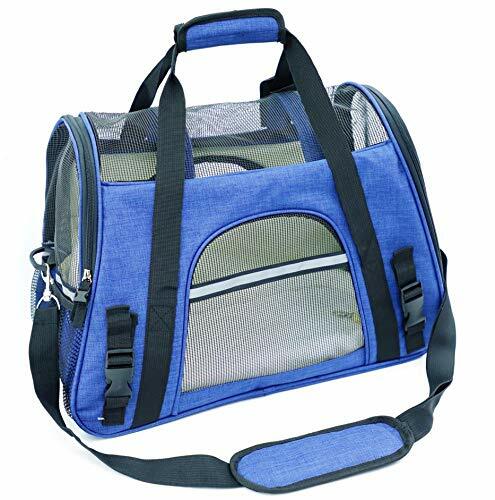 This cat carrier is just what you need to easily take your cat with you on vacation, to the vet’s office or anywhere else you need to go. It will last indefinitely with the proper care and provides plenty of protection and safety for your beloved feline. Two of the more important features that you want a cat carrier to possess is: plenty of room for your cat to be inside comfortably and a safe space for them to travel in that allows them to feel protected. If you do a lot of traveling with your cat you want to choose a cat carrier that will stand up to the rigors of travel. Cats can be avid scratchers so keep this in mind when you are looking and making your choice. The three cat carriers we reviewed above cover several different styles of cat carriers that are on the market. Two are soft-sided which work well for cats that are easy-going travelers. The hard-sided carrier is great for cats that tend to scratch wherever they are, as the hard plastic will stand up to the sharp claws of your pet. Read the buyer’s guide to get more information about choosing the right cat carrier for your cat’s needs and that works well for your travel preferences. If you will be traveling on airlines or other public transportation often, find out what the requirements are so you can look for carriers that meet those guidelines. You don’t want to purchase a cat carrier only to find it can’t be used on the airplane. There are a few points that we want to cover when it comes to choosing the right cat carrier. Most of the points pertain to the size of the carrier since this is the most important element of your cat carrier. However, for added benefit, we will cover additional important points. Many people think that purchasing a big carrier is better but when it comes to cats, this isn’t necessarily the proper choice. Cats usually love tight, enclosed places; that’s why they can often be found hiding in small, empty boxes. Choosing a carrier that is too large can make your cat feel insecure and scared. They typically like to have their backs against something when they are sitting and observing their surroundings which also helps them feel more secure. This secure feeling carries over to cat carriers as well. The reason cats feel secure with their backs against the wall is that it reassures them that nothing can get them from behind. Being in a carrier where he or she can feel one side of the carrier against them will help calm them down during the trip. Another reason to avoid a carrier which is too large is that when you are carrying it, there is nothing that will stop the cat from sliding around inside the carrier which can also be extremely upsetting. It can also be difficult to carry a cat carrier that is too big and bulky without hurting your back. It is important not to go too far in either direction which includes purchasing a cat carrier that is too small. Stuffing a cat into a carrier that leaves them crouched and feeling cramped will add to a cat’s anxiety while traveling. So, what is the right size? As a rule of thumb, shoot for finding a cat carrier that is roughly 1 ½ times bigger than your cat, and that is all. This will provide the cat plenty of room to stand up and turn around. If you are starting with a kitten you should purchase a carrier that will work for their adult size and not only their kitten size. While they are little, line the cat carrier with thick towels so the kitten doesn’t get sloshed around inside a carrier that they haven’t grown into yet. Make sure that you only consider cat carriers that are easy to keep clean. The hard-sided carriers are the easiest to clean; just hose them down and dry them off. Soft-sided carriers are much more difficult to keep clean. There are a few different methods to cleaning a soft-sided carrier but the most common is taking a warm, soapy rag and wiping off the sides and insides and then thoroughly drying the carrier. Should Two Cats go in One Carrier? It is better to put each cat in their own carrier if traveling with more than one. It helps eliminate fights between the cats due to the stress of traveling. Your cat will appreciate having their own space and there will be less of a chance of two stressed out cats fighting with each other due to the stress of being in a carrier without the ability to get out. Even if you are just going to the veterinarian’s office, put each cat in their own carrier to avoid any problem. Cats don’t make the best travelers but you can minimize the problems and their fear by purchasing a cat carrier that is the perfect size and style for their personality and the type of travel you will be doing. If you are simply driving to your destination, you don’t have to worry about the carrier being airline friendly, but if you are taking the train or plane, it is important that you know all the regulations and guidelines so you purchase a cat carrier that will fit within them. With all the different sizes and types of cat carriers on the market it can be a little challenging to know which ones are good quality cat carriers and which should be avoided. The information in this buyer’s guide is designed to help you sort through all the different choices and decide on one that will work the best for your cat and your travel needs. Once you know what to look for, deciding on the right carrier becomes much easier. You can eliminate larger carriers that don’t fit your needs and use your personal preferences to make the final choice, being confident that the one you choose will be just perfect for you and your pet.